Once upon a time in the Punjab there was a a Raja called Randhir Singh. 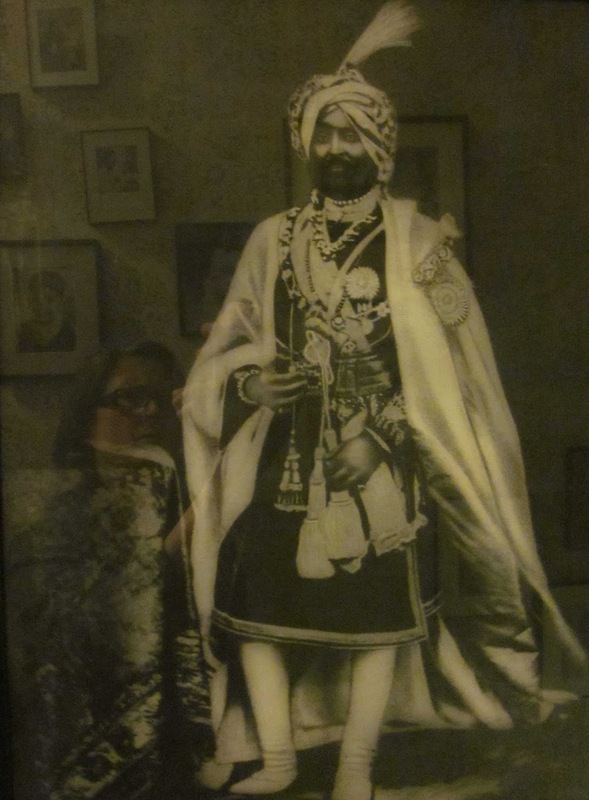 He was the ruling Maharaja in the state of Kupparthalla (or Kapurthala) and was responsible for restoring the families power and position by aligning himself with the British Empire. During the 1857 Indian Rebellion, Randhir Singh fought for the British, leading his troops at the Great Sepoy Mutiny. He received the Indian Mutiny Medal with one clasp in 1858 and built many public buildings, established a legal and judiciary system and Anglo-vernacular schools (just in case you were wondering whose side he was on). He was married three times, his first two wives dying in fairly quick succession after having three sons and a daughter between them in less than a decade. The Raja had been taught by an English tutor, Robert Hodges, an Indian civil servant. 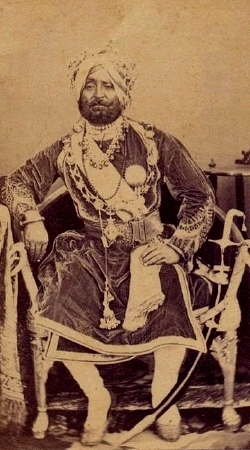 Hodges had a daughter who had been born in India, Henrietta Melvina, who became Rani number 3 in 1859 at Kaputhala Palace. The Raja, although Sikh, had a Christian ceremony for this marriage. The couple had three daughters, Melvina (1860-1919), Victoria (1861-1863) and last but not least, Helen Marion, born in 1864. Rani Henrietta divorced the Raja in 1869, not long before his death. In fact the Raja was on a trip to Europe when he died on his boat just outside Aden. Henrietta took her daughters back to London to launch them on society, whilst bagging herself a second husband, this time a Royal Artillery Staff Assistant Surgeon called John Hamer Oliver, whom she married in Bloomsbury in 1871. The girls were sent to school in London, then the hunt for husbands for them started. The family wasn't rich anymore, but no doubt a title didn't harm the chances of the girls in the marriage market. Melvina married Major Arthur Stronge Gilbert. I've read reports that Gilbert met Melvina while serving in India but as Melvina was 9 years old when she left India, let's assume that a tad spurious, although Major Gilbert was 20 years her senior, so let's draw a veil. It might have been that the Major had served in the same region and obviously been aware of the Raja and his family. The Major and Melvina had a son, born the same year of their marriage in 1883. Arthur Stuart Ahluwalia Stronge Gilbert, despite having an unwieldy name, went on to join the Indian Civil Service and was close friends with James Joyce, translating his works into French. Redcliffe Road, and very nice too. Alexa Wilding! It's a small world, isn't it? 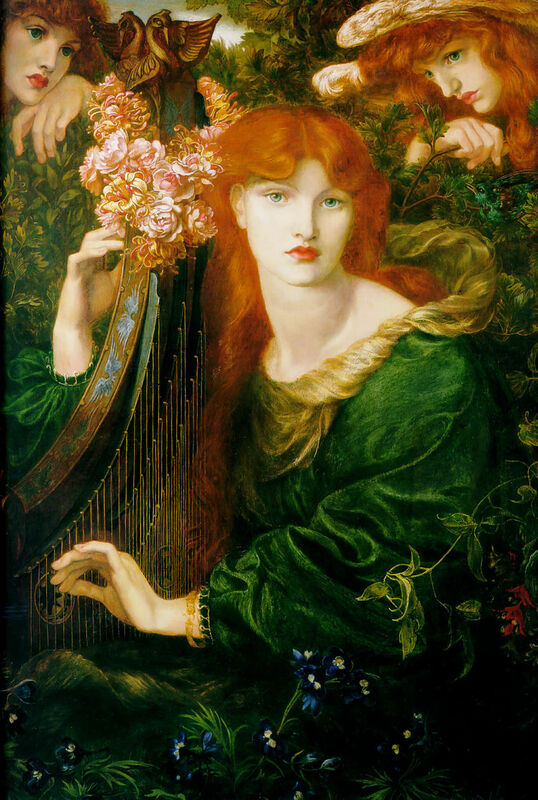 After I've written my sit-com all about how Karl Marx and Fanny Cornforth were neighbours in 1857, I'll write one about the artists' models of Redcliffe Road. Anyway, Princess Helen went out into society but her behaviour was rather 'unchecked', shall we say? 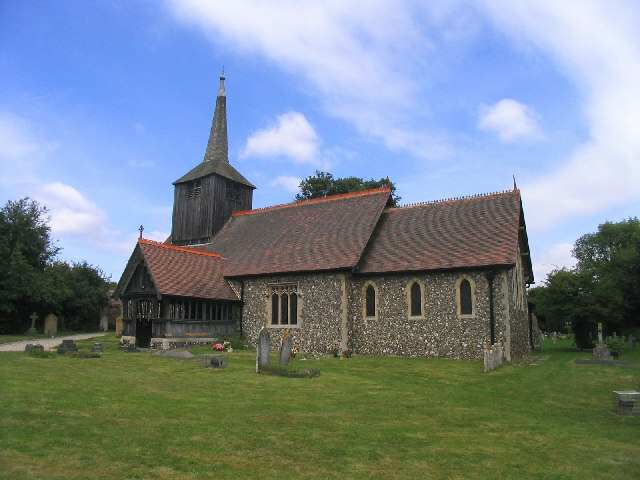 This was possibly because her mother's second husband John Hamer Oliver had died after only a couple of years of marriage, aged 36. In a letter from the artist Mariquita Jenny Moberly, stories of Princess Helen's antics come across vividly to all who had ever met her. Her mother allowed her to mix, unchaperoned, something frowned upon for the sake of reputation, and one story tells how she was seen in a room full of men, smoking! She also performed in tableaux vivant, re-enacting the parts she played in the paintings of Edwin Long. 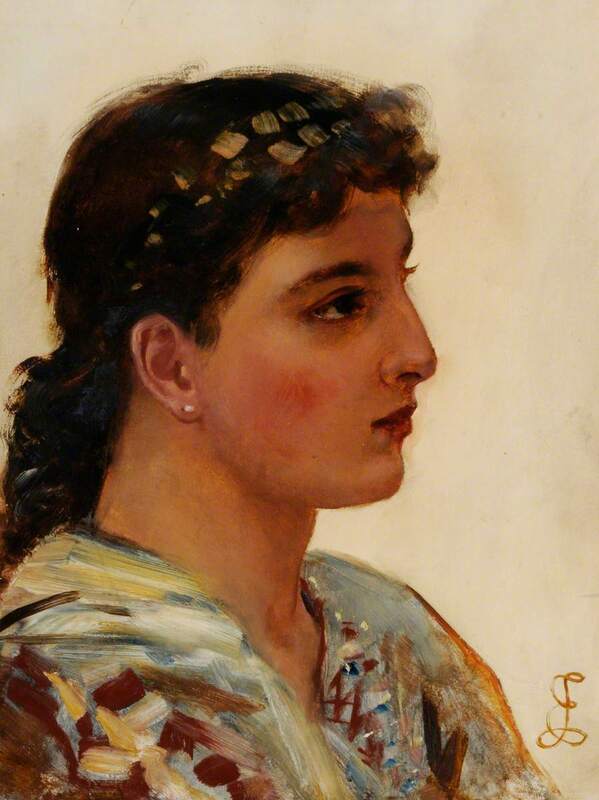 One role we know she played for Long is the illusive Judith of Israel, painted around 1884. Taking the image that we have of her, together with Mariquita Moberly's identification of Helen in the Long paintings at the Russell-Cotes Art Gallery (which has an enormous collection, in all senses, due to Merton Russell-Cotes firm belief that Long would be famous forever), I think it is fairly safe to say Princess Helen is Jephthah daughter, in the series of paintings Jephthah's Vow. For those who aren't familiar with the story, Jephthah promises to sacrifice the first thing he sees on his return from a mighty battle and of course, it's his daughter who runs to greet him. T'uh. 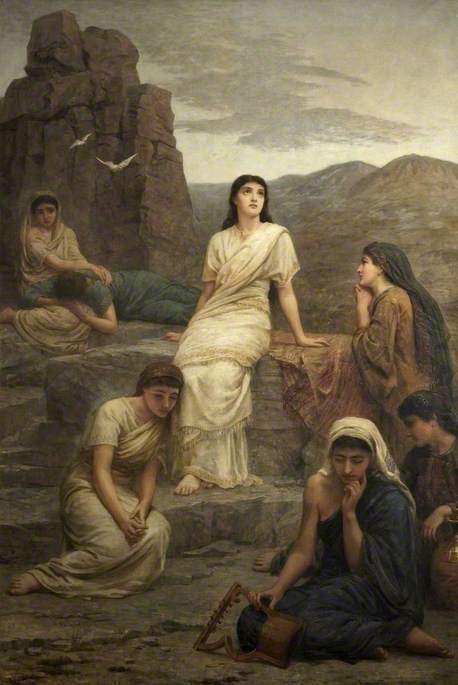 So, that is Princess Helen, suffering a terminal wardrobe malfunction, as the poor, sacrificed daughter of Jephthah. I was slightly surprised at the combination of the prestigious model and the unnecessary boobness, but thinking about it, why not? It's a bit like Princess Helen's slightly scandalous behaviour. At the end of the day, as long as it stays on the risque rather than out-and-out appalling (by their standards) end of the scale, she's still got a fabulous title and is dashed pretty too. The newspapers liked to report her activities, no matter how small, including a trip to private view day at the Royal Academy in 1884. 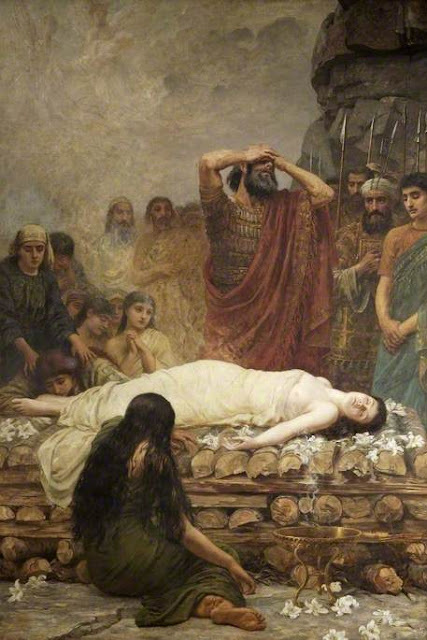 Well-known to the art loving public as Mr Long's 'Judith', the snide newspaper account continued - 'I need hardly add that Mr Long has considerably idealised the subject of his canvas. The Princess is somewhat short sighted and had to use eyeglasses to view the presentment of herself.' (from The Newcastle Courant, 9 May 1884). Her various charity activities were listed including repeat performances as a fortune teller, consciously or not playing on her 'exoticism' among her peers.